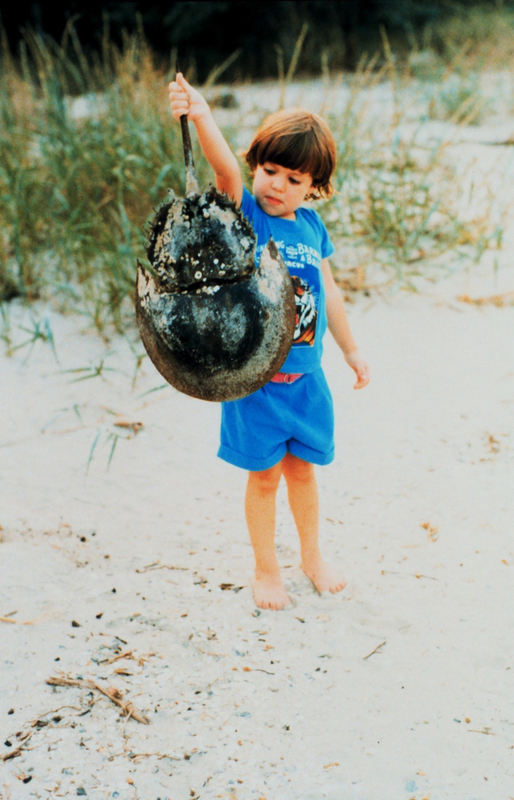 Young child examining an empty horseshoe crab shell. A horseshoe crab is apart of the eukarya domain because it is a multicellular species whose cells contain a true nucleus as well as membrane bound organelles. This organism is part of the animalia kingdom because it is multicellular and has to obtain food by eating and digesting other organisms which means that they are heterotrophic. Their cells have a cell membrane but not a cell wall which is another characteristic of the animalia kingdom. A horseshoe crab is part of the phylum arthro poda. It has five pairs of jointed-legs and is also a invertebrate, meaning an animal without a backbone. This organism has a chitinous exoskeleton and grows by molting. Want to learn more about some different arthropods? Click here to explore the world of the deer tick and here for the yetti crab! Above: An overturned horseshoe crab. A horseshoe crab is part of the cheilcerata because it lacks jaws. The horseshoe crab is a merostomata because its legs surround the mouth. 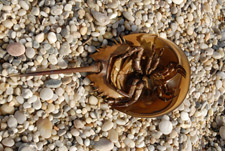 The horseshoe crab has a sword tail which the Xiphos- Greek prefix means sword. The –ura suffix means tail therefore placing it in the Xiphosura subclass. A horseshoe crab is part of the xiphosurida order because it is a sword-tailed animal. Members of the limulidae family only contain the four species of horseshoe crabs, therefore, limulidae means horseshoe crab. 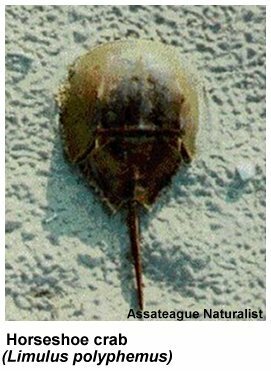 The horseshoe crab has compound eyes that are sideways therefore is part of the Limulus genus. Limulus is a Latin term meaning slanting, unusual, or crooked. The horseshoe crab has simple eyes located on the front of the shell categorizing this organism as polyphemus species. The Greek term polyphemus signifies a one-eyed giant. Limulus polyphemus -Limulus is a Latin term which means slanting, unusual, or crooked. -polyphemus is a Greek term that signifies a one-eyed giant. 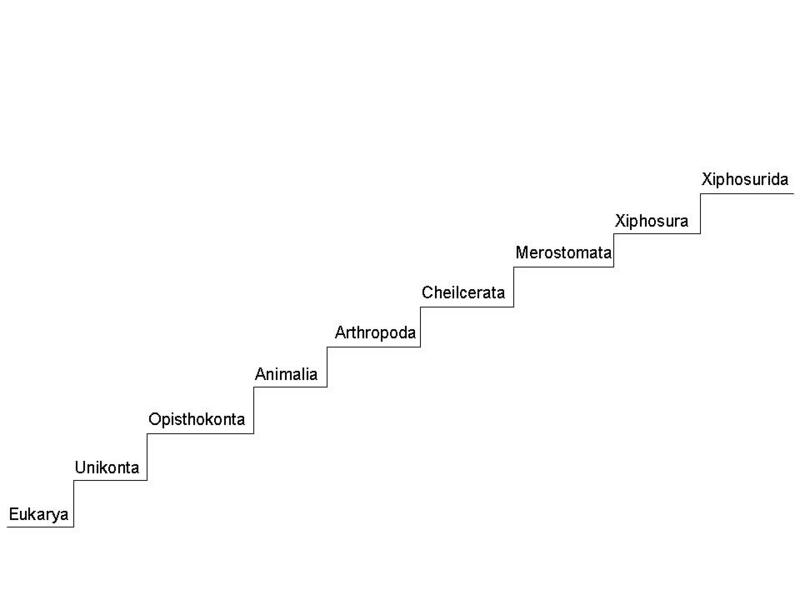 This phylogenetic tree represents a broad morphological classification starting with eukarya and increase in complexity as it moves farther down the tree. The closest relatives to the Limulus polyphemus are shown in this phylogenetic tree which is based on a morphological classification. All members in this tree are part of the family limulidae. Its closest relatives are the three other species of horseshoe crabs located in other areas in the world. 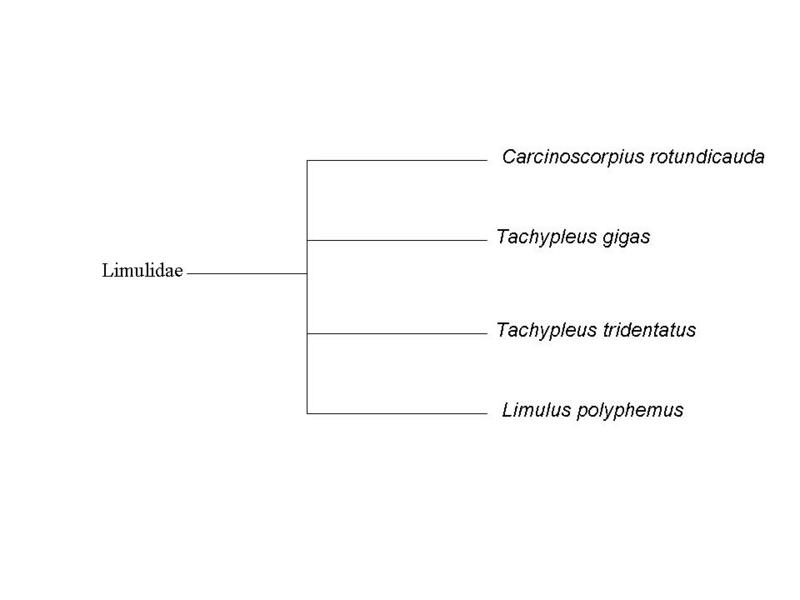 I created both phylogenetic trees above referencing the information from http://www.ceoe.udel.edu/horseshoecrab/ and http://horseshoecrab.org/ as of April 10, 2011. If you would like to learn about the habitat of the organism click here!